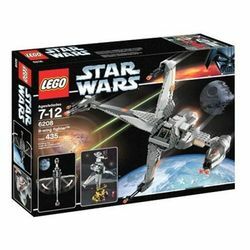 B-Wing Fighter is a Classic Star Wars set released in 2006. It included the B-Wing Pilot and Ten Numb Minifigures. It also includes a Service Tower, which acted as a display stand. The B-Wing Fighter is mostly light- and dark-grey, with several orange stickers. The cockpit opens to seat one minifigure and features some controls. There is one main wing and one S-foil on each side, all of which are mostly light grey and have a circular orange sticker each for decoration. The S-foils open and close so the B-Wing can alter between attack and flight mode respectively. The main wing has a large blaster cannon on the end while each of the S-foils feature a smaller blaster cannon on their tips. The engine is in the centre of the ship and consists mainly of dark grey bricks. Two projectiles can be fired by pulling and releasing a small handle at the back. The service tower is mostly black and yellow and reaches up most of the length of the main wing. A ladder leads to the platform on top, and at the top there are some tools. The service tower doubles as a display stand. The B-Wing Fighter fought alongside rebel forces in the Battle of Endor. This is the second release of the B-Wing Fighter, the first being 7180 B-Wing at Rebel Control Center. This is the first set to include a Ten Numb minifigure. The main play feature of this set is the double barreled missile launcher found between the wings and the cockpit. by pulling back a small handle and releasing it, two projectiles, similar to Flick missiles would fly out. There is a compartment for missiles on the base of the service stand. An error in this set is the portrayal of the engine as a missile launcher. The tower does not reach the cockpit, only the main wing. In the Star Wars universe, B-Wing Fighters would dock on their sides with their S-foils folded inwards, meaning there would be no use for the service tower to begin with. This is a description taken from LEGO.com. Please do not modify it. Powerful fighter of the Rebel fleet! Build the Rebellion's heavy strike ship with this exciting set! Just like the classic Star Wars vessel, its wings can fold for flight or vertical landing. Challenge the forces of the Empire and use your launchers to save the day! Service tower doubles as a display stand for the fighter and can fold down for easy storage. Cockpit opens so you can put the B-wing pilot at the controls. Includes Rebel pilot. Fold the wings for landing or flight! Missiles launch! Service tower doubles as a display stand! Facts about "6208 B-Wing Fighter"
Powerful fighter of the Rebel fleet!